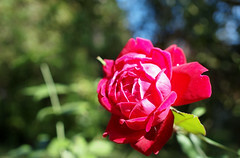 Posted by admin on May 10, 2013 in Literature, Poetry, Robert Burns and tagged Red Rose, Robert Burns, Rose. 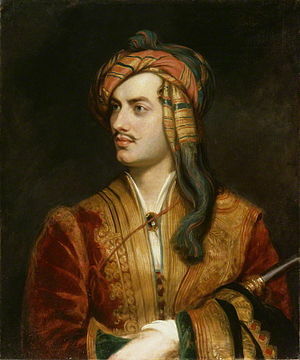 Posted by admin on May 9, 2013 in Literature, Lord Byron, Poetry and tagged Byron, george gordon byron, Lord Byron. Most modern anthologies have kept Blake’s choice of the archaic spelling “tyger”. It was a common spelling of the word at the time but was already “slightly archaic” when he wrote the poem; he spelled it as “tiger” elsewhere, and many of his poetic effects “depended on subtle differences of punctuation and of spelling.” Thus, his choice of “tyger” has usually been interpreted as being for effect, perhaps to render an “exotic or alien quality of the beast”, or because it’s not really about a “tiger” at all, but a metaphor. “The Tyger” is the sister poem to “The Lamb” (from “Songs of Innocence”), a reflection of similar ideas from a different perspective, but it focuses more on goodness than evil. The poem also presents a duality between aesthetic beauty and primal ferocity. The speaker wonders whether the hand that created “The Lamb” also created “The Tyger”. 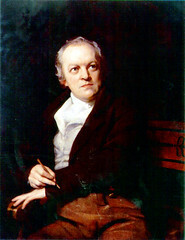 Posted by admin on May 9, 2013 in Literature, William Blake and tagged arts, entertainment, In the Forests of the Night, Lamb, literature, Poetry, Songs of Innocence and of Experience, Tyger, William Blake. Posted by admin on May 9, 2013 in Audiobooks, Emily Brontë, Literature and tagged Emily Brontë, victorian readers, Wuthering Heights. Posted by admin on May 8, 2013 in English, English for Kids, Videos and tagged Learn English with Muzzy, Learn English with subtitles, Muzzy, Muzzy in Gondoland, video. Sometimes the Dashwood girls do not seem like sisters. Elinor is all calmness and reason, and can be relied upon for practical, common sense opinions. Marianne, on the other hand, is all sensibility, full of passionate and romantic feeling. She has no time for dull common sense – or for middle-aged men of thirty-five, long past the age of marriage. 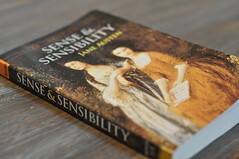 Posted by admin on May 8, 2013 in Audiobooks, Bookworms, Downloads, Jane Austen, Literature, PDF and tagged audiobook, Jane Austen, Sense & Sensibility, sense and sensibility, sense and sensibility by jane austen. London is the capital city of England and the United Kingdom, and the largest city, urban zone and metropolitan area in the United Kingdom, and the European Union by most measures. Located on the River Thames, London has been a major settlement for two millennia, its history going back to its founding by the Romans, who named it Londinium. London’s ancient core, the City of London, largely retains its square-mile mediaeval boundaries. Since at least the 19th century, the name London has also referred to the metropolis developed around this core. The bulk of this conurbation forms the London region and the Greater London administrative area, governed by the elected Mayor of London and the London Assembly. London is a leading global city, with strengths in the arts, commerce, education, entertainment, fashion, finance, healthcare, media, professional services, research and development, tourism and transport all contributing to its prominence. It is the world’s leading financial centre alongside New York City and has the fifth- or sixth-largest metropolitan area GDP in the world depending on measurement. London has been described as a world cultural capital. It is the world’s most-visited city as measured by international arrivals and has the world’s largest city airport system measured by passenger traffic. London’s 43 universities form the largest concentration of higher education in Europe. In 2012, London became the first city to host the modern Summer Olympic Games three times. A multicultural city, London has a diverse range of peoples and cultures, and more than 300 languages are spoken within its boundaries. The 2011 census revealed that around three quarters of Londoners were Britons and 60% of inhabitants were white, and that 45% of residents were white Britons, making them a minority in the city for the first time. London had an official population of 8,174,100, making it the most populous municipality in the European Union, and accounting for 12.5% of the UK population. The Greater London Urban Area is the second-largest in the EU with a population of 8,278,251, while the London metropolitan area is the largest in the EU with an estimated total population of between 12 million and 14 million. London had the largest population of any city in the world from around 1831 to 1925. The annual UEFA Champions Festival will take place in London from 23–26 May. 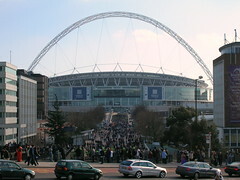 Wembley Stadium will host the 2013 UEFA Champions League final following a decision by the UEFA Executive Committee in June 2011. The highlight of European football’s club calendar returns to the London venue for a record seventh time, and the second time in three years following the 2011 final, to mark the 150th anniversary of the Football Association (FA). And here’s another documentary of how the Geographic Channel sees London. congestion= overcrowding; clogging: severe traffic congestion. Posted by admin on May 7, 2013 in English, Learning English, Videos and tagged Arsenal, Britain, Chelsea FC, Colonialism, England, FA Cup, Football Association, Football League, Greater London Urban Area, London, London Underground, Megacity, Premier League, Stamford Bridge, Tottenham Hotspur FC, Wembley, Wembley Stadium. This acclaimed course uses the award-winning video character MUZZY, compelling stories and delightful songs to bring language to life. It’s fun and it works. Almost like magic, the proven “see-listen-and-learn” technique engages kids’ natural ability to learn language. Posted by admin on May 7, 2013 in English for Kids, Learning English, Teaching English, Videos and tagged Languages, Learn English the funn way, Learn English with Muzzy, Learn English with subtitles, Linguistics, Muzzy, Social Sciences, The Body. An interesting, brilliant documentary about life and works of Charles Dickens. Posted by admin on May 6, 2013 in Charles Dickens, Literature and tagged Charles Dickens, literature. Learning a language broadens kids’ views of the world. It means to speak, read, write, listen and think in another way. It’s best to start children learning a new language as young as possible. Young children have the ability to learn a new language without their first-language accent. Learning a new language takes commitment. Learning a language is a wonderful opportunity for kids to broaden their view of the world; it means understanding and learning to speak, read, write, listen and think in another way, and to explore and appreciate the wealth of knowledge that is part of each language and its culture. Communication: your child learns to communicate in the language and develops an understanding that there is more than one way to interact with people. Academic: your child learns about how languages work and their literacy skills are enhanced because a clear link exists between learning another language and literacy development in English. Critical thinking: your child’s analytical skills are increased along with their ability to transfer skills across languages. Cognitive: your child’s problem-solving skills are enhanced along with thinking laterally and working collaboratively. Personal: your child’s self-confidence, self-esteem, resilience and tolerance are increased. Cultural: your child develops an understanding and respect for other cultures, people, their ideas and ways of thinking. Vocational: your child’s career opportunities will be greater in an increasingly globalised market. Social: your child’s global connections are enriched. What age should my child start learning a new language? While it doesn’t matter when your child begins to study another language, it’s best to start them as young as possible. Why? Their oral skills are easily developed. They tend to be happy to experiment with the new language and its words. Learning a new language is a commitment for children and their parents because it takes a long time to become proficient. Knowledge and skills are built up over time and the more time your child spends using the language, the better they’ll be at it. Posted by admin on May 5, 2013 in English for Kids, Learning English, Teaching English and tagged Benefits, Benefits of your child learning a new language, Children, Early Childhood, English language, First language, Language, Learning, Linguistics, Second language, Social Sciences. Posted by admin on May 5, 2013 in English for Kids, Videos and tagged English for Kids, Languages, Learn English with Muzzy, Learn English with subtitles, Muzzy, Muzzy in Gondoland, video. Read and listen at the same time, the other parts will be posted here after a few days. Posted by admin on May 5, 2013 in Audiobooks, Emily Brontë, Literature, Novels and tagged arts, Books, Emily Brontë, english literature, Heathcliff, literature, victorian readers, Wuthering Heights.